I had a lot of fun filling these itty bitty baskets with Easter candy to give to my Stampers Club gals this month. To make the tag, I used the bunny from Eight Great Greetings and coloured him in with Soft Subtle markers. She was then punched out using the Round Tab punch and layered on the free pink heart-ed "Welcome Neighbour" paper pack from the SAB catalogue. 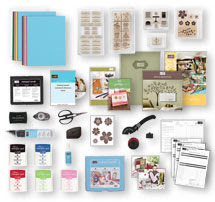 Now is the perfect time to order your personalized Starter Kit since not only is it on sale for 15% off until the end of the month, but you also get FREE STAMPS (any price!) as an added bonus! Contact me for more information or if you're ready to order now, click HERE and use canada as your password to begin and you'll be all set to start ordering for yourself at a great discount. Awesome work! I like your work because I know the importance of craft and painting and also like to do that. I like your work very much and your blog have given me idea to do craft work in different field.